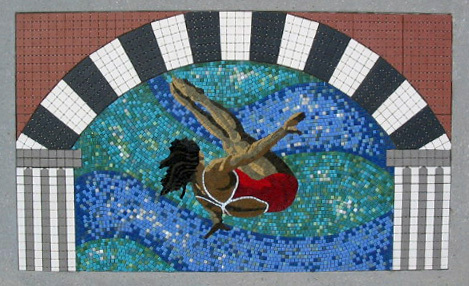 We are inspired by historical glass mosaics and love the vibrant color and ability to convey imagery with this medium. We create our designs with hand nipped glass, emphasizing compositions of color and texture. They are constructed in our studio and secured in sections, making them easily transported to location. Some of the glass is solid in color while others are iridescence. Glass has an amazing visual quality and particularly brilliant in direct sunlight! It’s resilient, unfading and often used in outdoor pools and indoor showers for these qualities. This work is thought provoking piece reflecting on the disappearing icon of the prairies. The elevators are floating away into the sky in both a beautiful and lamenting way, they are disappearing like a child’s lost helium balloon. The viewer will be looking up to see this work and would have the same perspective watching up into the sky to see this unusual scene of the floating elevators. 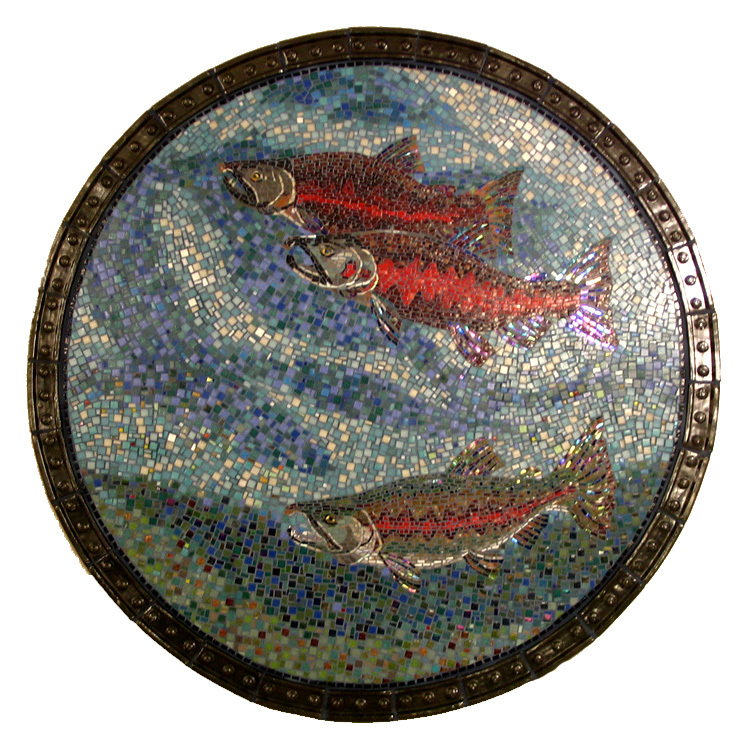 This was commissioned by the City of Red Deer to replace the old fish mosaics that could not be saved in the new construction of the building. We chose the most local fish in Alberta including the salmon that actually spawn on the border with BC. Each has a clay roundel border that looks like metal casings with bolts to imitate a fish tank wall. 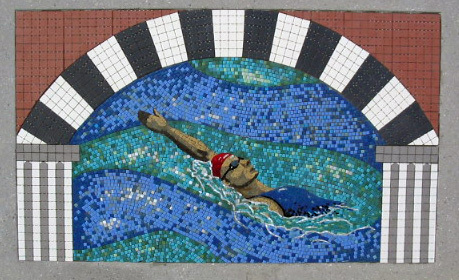 This was our first commission using glass mosaic. The original mosaic was backwards with Jesus’s left hand blessing a boy. The church wanted the hand and the boy removed and replaced it with the proper arranged hand and bible, as well some additional symbols which included some of the old glass.